All data processed by AppMetrica has always been anonymous and de-personalized. In AppMetrica reports, you can only see technical and non-sensitive data that cannot in any way be exploited to establish a user’s identity. In addition, the AppMetrica SDK offers an option to disable sending statistics on the client side (Android | iOS (Objective-c) | iOS (Swift)). This allows easy implementation of an opt-in/opt-out feature in your application. We have thoroughly researched the GDPR requirements with the help of legal advisers both within Yandex and outside the company to make sure that our procedures of data collection, storage and processing are communicated fully and transparently. Click here to review our Data Processing Agreement. We have introduced the option to digitally accept the Data Processing Agreement. To do so, check the relevant box when viewing your app’s settings or when adding a new app. All AppMetrica users can request that the full IP addresses of their application users will not be processed or stored on our servers. 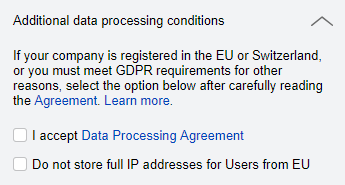 Even though this may affect the accuracy of user location data, we have made this option easily available to all AppMetrica users regardless of whether or not they need to be GDPR-compliant. All you need to do as an AppMetrica user is check the relevant box in your app settings. If you enable IP masking, AppMetrica hides the address as soon as it is technically possible at the earliest stage of data collection. When AppMetrica receives the data, it resets the last octet of the IPv4 address or the last 64 bits of the IPv6 address. For example, it changes the address 192.0.2.2 to 192.0.2.0. What do our customers need to do? Carefully study and accept the Data Processing Agreement with AppMetrica when you receive a notification or see the relevant box to check in the AppMetrica interface. If you have any questions about the Data Processing Agreement, we are here to help. You can contact us using our special feedback form.